BACKTOFRANKBLACK.COM: How can YOU help bring back Millennium? How can YOU help bring back Millennium? We get some very nice supportive emails from Millennium fans at BacktoFrankBlack.com (info@backtofrankblack.com if you want to join such praised fans), and one question we get asked a lot is "what can I do to help bring Frank and Millennium back?" So here are some simple tips as to how you can help, kind wonderful Millennium fans that you are! We mention this q uite a lot - letters are oh-so-important. A campaign can succeed on letters. They demonstrate genuine consumer support. An internet petition is great (and yes we do have one, but let's stick to letters for now), but anyone can spend sixty seconds clicking a link and adding a name. If you can imagine being in the position of deciding on what multi-million dollar project you are going to green-light, would you put faith solely on a net petition? No. It may help give you an idea of interest in a show, but letters on a desk shows someone who has written, printed, posted their support - that's a far bigger commitment. 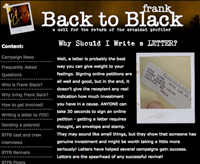 We appreciate letter writing isn't easy - so we have a page at BacktoFrankBlack.com to help you. Simply click here to be taken there! We don't want to harass you into buying DVDs, but if you are looking at a way to support backtoFrankBlack you can't go wrong with purchasing the DVDs - simply because alongside letters, a display of consumer power really turns industry heads. If the DVDs sell well, it shows people don't just like the show, they'll pay for it. Money - believe it or not - goes a long way in the entertainment industry my sweethearts. Click one of the links on this site to go and purchase from amazon.com, or pick your own method of purchase! Doesn't really matter where, as you long as you support Millennium by buying Millennium - and you can get some pretty good deals on the DVD sets as well. If you don't live in the States, we recommend maybe looking at places closer to home that would incur delivery, for instance, amazon.co.uk or play.com for British followers. Look for the bargains! We must confess, through this busy year the core BTFB team haven't headed out to th e horror/sci-fi cons, but again, this is something we'd love to see people do: going to conventions and chatting about Millennium. Word of mouth - spread the word! We even have some handy flyers if you are feeling uber-focused. Don't be afraid to wag that tongue and tell people what's going on. Tell them about BacktoFrankBlack, tell them how Lance is keen to come back in the roll. And of course, let us know you're doing it! The more feedback we get back from you guys, the more we can use to promote ourselves! Show us you are spreading the word at the cons, and we can then tell industry/media contacts that is what you merry people are doing! If you meet any of the cast and crew from Millennium, send us a picture of you with those talented people and we'll post it here! Lance is very keen to see a Millennium theme run at a con - and willing to help trying and pull some support from the cast and crew! If we knew you people were interested, your feedback might make it happen. It's just talk at the moment, but who knows - if we get the interest the idea might sell! Help us on this blog! We have several inititives running at the moment - some with prizes! We have our caption competition Lights, Camera, Caption! - we've already had some great replies! We have our Seven and One: Tell us about you! Got a Millennium tattoo? We'd love to hear from you! Art? Music? Let us see your work! Want to voice your opinion on our blog? Email me at jim@backtofrankblack.com for the opportunity! Again, we're a platform for the fans, so we are very happy for fans to take the stage and show their love for Millennium! If you want to link to this blog - and vise versa - let us know and we'll add you as an affiliate! Post about us on your blogs, put us in your signatures, tell the internets all about us! We have a load of banners and icons for you to download and even some wallpapers and avatars to help give you that BacktoFrankBlack identity you've always wanted! Our Myspace is a growing community as well! Link in with us at www.myspace.com/backtofrankblack! Don't be afraid to tell us what you think. You may notice the DVD links on the blog and website. These are there because someone recommended we did it, so we did. We appreciate feedback. Contact us on info@backtofrankblack.com or if you want to speak to me jim@backtofrankblack.com. You can help us shape YOUR campaign. Because in the end, this campaign is for the fans. Finally... don't give up hope! We have Lance firmly on our side, the media has been very receptive, the cast and crew we've interviewed are v ery eager. Lance has even said he's noticed rumblings of interest within the industry towards the campaign. Your voice is vital - don't miss the opportunity to get involved! We have more stuff planned: big interviews, interactive events, more press updates and a very unusual little scheme that will give you guys to hear a little of Frank once more..
Bookmark us, talk to us, and let's really work together to bring Frank Black back! 1 Response to "How can YOU help bring back Millennium?" I've sent a number of messages to Fox but didn't realise there were so many other ways of helping you guys, will certainly see what I can come up with. I'm 100% behind you all, let's get this movie made. BTFB IN THE MEDIA - SCIFI NOW #25 NOW ON SALE!